This World Cancer Day, one Dubai woman from the UK is back in London fighting for her life – with followers from all over the world rooting for her. Petrina Barber’s son was four months old back in 2014, when doctors found her cervical cancer. She had been ill during the pregnancy, vomiting and constantly finding herself in the hospital — but doctors didn’t see anything out of the norm. By the time the doctors found the tumor it was too big to operate on. Barber had to have chemotherapy and radiation straight away. She couldn’t eat. She became weak. “I was in a wheelchair, in bed or lived in the hospital.” Her husband washed her hair and brushed her teeth, all while looking after their new baby. “He kept it all going after being told his wife was likely to die,” Barber said. Barber, who is now 37, survived and finished treatment in 2015, yet the side-effects of the treatment persisted. She is currently fighting the impact of radiation damage to her organs, for example. “I can no longer eat food or drink as I have a blockage in my bowel,” explained Barber. Surgery is the only solution, but she’s too weak and undernourished to undergo it. “So that’s all it in a nutshell,” she says. It’s something Barber documents openly on her Instagram account, @MyUltimateHealthProject. She’s back in the UK undergoing another round of surgeries and treatments. 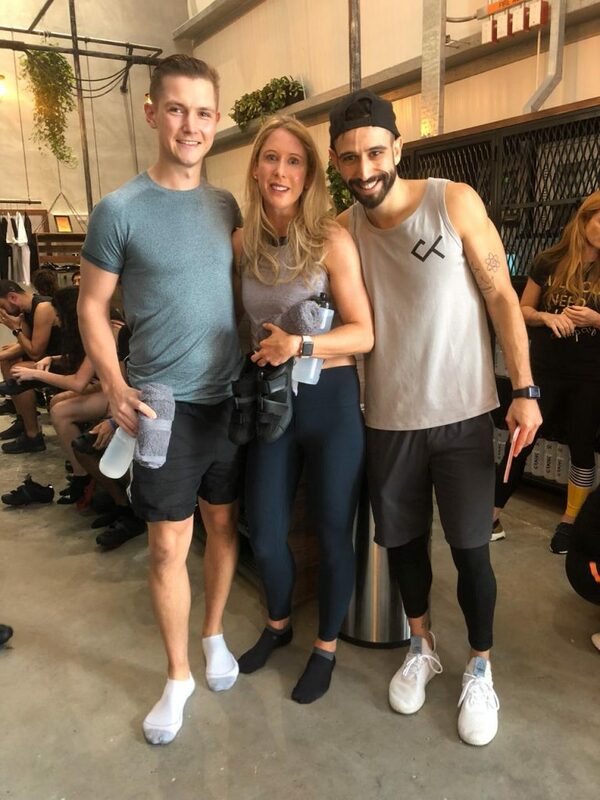 Petrina Barber in stronger times, with Nuno Costa Fernandes, indoor cycling instructor from the Al Serkal gym Crank (right) and Chris Beavers, her personal trainer. Photo: Petrina Barber. Giving her hope throughout has been the thought that life is worth living for. “There’s so much joy and happiness in the world and so much love and good in people. No matter how bad things have been or what I’ve been told, I truly believe it’s not my time to leave yet.” There is a hope, she explained, that is linked to survival. Be positive if you want, she said. But being sad is fine too, if that’s how you’re feeling. While friends and family also play a big role in helping a cancer patient battle with the disease, the experience can be terrifying for loved ones, noted Barber. Also there for Barber as she posts daily updates are more than 16,200 Instagram followers around the world, many of them – inspired by the daily #gratitudewalk she takes around the hospital when she can – dedicating their daily workouts and walks to her. People need to appreciate their health while they have it, Barber reminded her followers on Instagram stories last week. Barber, who is currently in hospital, documenting her progress and setbacks as she tries to get strong enough for surgery, says getting through her days are not about magical advice or healing words. Barber’s future goals involve being the best parent she can be for her son, and the best wife for her husband. “For years he’s been my rock,” she said.